I also suggested rather than calling women stupid or debating the validity of the decision to have a home VBAC , we should consider why women make this decision. First, it is not one they take lightly. Every parent wants a safe, healthy birth for themselves and their baby. It takes more research, work, and energy to plan a home VBAC—and it usually means thousands of out-of-pocket dollars up front. It is most certainly not the easy way out. Women choose out-of-hospital birth due to disrespectful and abusive care, including obstetric violence and forced/coerced cesareans, delivered by hospitals. Parents also choose out-of-hospital VBAC due to VBAC bans and restrictive VBAC policies (i.e., repeat CS scheduled at 39 weeks, labor can only last 12 hours, baby must weigh less than _____, no induction/ augmentation, etc.). And this isn’t a comprehensive list of why women choose home VBAC, but it’s the ones that many nurses, providers, and administrators have control over. In my comment on the nurses’ group, I posted the link to my California Medical Board testimony addressing these barriers and the resulting importance of access to out-of-hospital VBAC. I also suggested that coming from a place of judgment on this option may very well color the tone of their communication. Even if they’re not using the words “stupid” or “reckless,” parents will pick up on what’s not being said. That’s not good for the provider-patient relationship. People want to be heard, understood, and respected. All of us. It’s important to hear parents when they talk about their past hospital experiences, without being defensive. Hear them and see it as an opportunity to make a change. Consider how you can make a difference in your practice and facility. If this were any other business, we would probably say that this is a services and marketing problem. If you have a restaurant, and you start to lose customers to a competitor, you figure out why your customers are leaving and appeal to that. You don’t slam the other restaurant. You don’t call your customers stupid because someone else is offering a product that they like better. Even if you would never personally eat there, that other restaurant is offering something that people want. And they are leaving your restaurant to get it. So, find out what that thing is and change it. Yes, I said all that in this nurses’ group. The next morning, I checked to see how my comments were taken, because I know from experience that not everyone wants to hear or acknowledge the realities I outlined. I smiled to see that the conversation had remained respectful, even from some folks who disagreed with me. There was no name calling. No personal attacks. My comments even had a couple likes! It is possible to disagree without being disagreeable. And I think it’s so important to consider that many women around the country do not have access to respectful care in a facility that supports VBAC. What are some other reasons that women choose out-of-hospital birth? Leave your comment below. Some women choose to birth at home–after AND before cesarean–because they feel like that’s the best place for them to birth, and their top priority in giving birth is not pleasing hospital staff. After all, it’s not like there’s any empirical data proving that the outcome would be worse than in any hospital; quite the contrary. Read David Stewart’s FIVE STANDARDS FOR SAFE CHILDBEARING. Being in a hospital when nothing’s going wrong is not one of them. Face it: most women “choose” to birth in hospitals because their insurance will cover it (maybe), and they’ve been conned into believing that it’s safer. Meanwhile, ‘blaming the victims’ is a classic propaganda technique. I am choosing an unassisted at-home VBAC, because I feel I have no choice. I switched to Kaiser Permanente during open enrollment because they assured my husband and I that they are very VBAC friendly. Well, once the open enrollment window was closed and we had established care they wanted to schedule a repeat c-section before 38 weeks, because in my last pregnancy I had high blood pressure at the end. My last blood pressure reading at Kaiser was 112/54. I have stopped going there for prenatal care, as of 33 weeks, because I am sick of them pressuring me and not listening to me. They told me that a scheduled c-section would result in less complications for me than if I went into labor first. During my first scheduled c-section, my bladder was misplaced. How is having an entire organ misplaced in my body to my benefit!? How is that not considered a disaster by the medical community?! Why are those complications not even tracked!? My medical history and current health were completely, and recklessly, disregarded. I realized that Kaiser Permanente considered an entire misplaced organ a non-issue. How could I feel safe there? And with open enrollment closed, I have no ability to get new insurance and a new provider. They committed advertising fraud by telling me I could get a VBAC there and now they want to endanger me and my baby by scheduling a surgery that they feel has gone fine if only 1 organ is misplaced and no longer functions as designed. 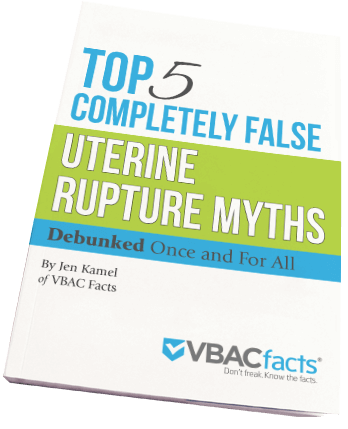 Another reason Mothers may stay home to VBAC is that they are not given all the hospital facts. “Find a vbac friendly provider” is often impossible, but sometimes the nursing staff is perfectly willing to assist with a patient VBAC (and they do most of the work before the dr gets called anyway). That being said, a mom still has to fight the scheduling of the early surgery, and stand firm upon entry to the hospital by refusing surgery. I suggest not only polling OBs for their stance but also interviewing L and D nurses to find out about their personal ability to assist in hospital. Many are supportive as long as they don’t compromise hospital policy. I was told “no one can make you have surgery” by staff at a vbac banning hospital. It still requires grit and determination to fight for what you want though, so I can see why many moms stay home. I did. Trying to Vba2c at home 20 min away from a rural hospital w surgery staff “on call” was what I had to risk to get what I wanted. Then you are blamed for “taking unnecessary risks” because you didn’t do what professionals suggest. It’s a lot of guilt to shoulder. The hospital policies are sometimes really restrictive. At my first vbac, I had a great doctor and a cooperative hospital and they were actually quite respectful of my decision to do a vbac. The next time around, with a different doctor and different facility was a completely different experience. The doctor was supportive and doing everyhting to make the vbac happen. The hospital staff was nasty to say the least. There was lots of fights and pressure going on at the birth, which made the experience extremely stressful. That doctor has since left that hospital and is continuing to encourage vbacs at a different facility. I am pregnant now, and dont live in that state anymore, so looking for a doctor and facility that respect and cooperate with vbacs. That doctor claims that according to the ACOG there arent that many risks as the patients are being scared into and he believes that every woman should be given a fair chance. All of you that are being discouraged, find a different option, but most definitely dont agree to another c-section! Thank you for writing that on the nurse’s group chat. I am choosing homebirth for my third after two hospital births -the first was just fine but the second I was manipulated into a csection from the start. While nothing in particular about the csection itself would be considered traumatic medically (I didn’t have any complications it was a ‘success’ etc) it was traumatic for me. Watching a documentary months later a scene in a labor ward and the casualness with which they were talking about giving pitocin started giving me a panic attack. I shut it off and finished it later but my point being for some of us even with great access the risk to birth in a hospital is too great-having to fight back for what we know is safe, fighting against pressure to do or not do something while you’re in the throes of labor. Why would any woman want her birth to be a fight for with the people who are supposed to help her? I feel like if I even set foot in another labor ward I would go into a full panic so homebirth is the safest choice for me and my baby. Another reason women choose out-of-hospital birth, and the biggest reason why I chose home birth for my 3rd VBAC, is how their babies will be treated. Nurses will come into your room while you’re trying to get some sleep and take your baby to the nursery, even if you tell them not to, and perform tests without your knowledge or consent. My 2nd baby was born with a group B strep infection, and I found out after the fact that they’d done 6 spinal taps on her to check for meningitis. They couldn’t get enough fluid (surprise! She’s a newborn! ), so they kept trying. So with my third, I insisted they wake me up when they take the baby so that I could give consent and hold her during tests, but they ignored my requests. With my 4th, I almost risked out of Midwifery care, but since I wasn’t going to ever step foot in a hospital with a newborn, I decided on an unassisted home birth if all else failed. Fortunately, and after much searching, a local midwife decided to take me as a patient, so I didn’t feel pressured to go that route, and had a peaceful home birth. Those are exactly the reasons I chose a home VBAC. My csection was coerced and unnecessary. After the abuse I suffered then, I was too scared to have another hospital birth. I did NOT want a home birth, but the high csection rates and the treatment I recieved by the doctors and nurses at my local hospital basically forced me to. I did the research, I weighed my options, it was not a decision I took lightly. In the end i felt a home birth was safer. Amen. I recently had a dialogue with a nurse who could not abide one woman’s decision to plan an HBA2C after being turned down by multiple doctors. All she could do was hysterically rave about what might go wrong. When I tried to point out that whatever she said was lost in her tone, and it would be more helpful to suggest ways this woman could find the hospital-based care that apparently wasn’t available in her area, all she could do was say “Well, I’m a nurse and I’ve seen what can go wrong!” It didn’t even occur to her to ask what led this woman to make a choice that she herself would never make. Far too many health care providers don’t even hear themselves. I hope more respectful dialogue such as this is in the future. I recently moved from Omaha, NE to Houston. I was so excited to be coming to such a large city where there would surely be amazing options for VBAC moms. And I’m so sad and disappointed to learn that that’s not the case. Most people expect smaller cities and rural America to not have much to offer I many areas, including health care, but to have such poor VBAC access in a city this size is appaling! A fire has been rekindled under me to help increase VBAC access and reduce cesareans. (I’m also a birth doula and lead an ICAN group for nearly 7 yrs). I love your call for respectful dialogue, Jen and am so glad you showed up in that group and on that thread. Another restrictive VBAC policy that I see in my community is hospital anesthesia refusing to give epidurals to TOLAC mothers. This wouldn’t necessarily lead women to birth at home, but just wanted to share another example of a restrictive policy.